Owners that feed their pets ad lib sometimes panic when they find out one pet needs a different diet from the others due to a medical condition. One way to avoid this problem is to switch all pets to timed meal feeding even if they’re on the same diet. This can be pretty tricky, but not to fear, it can be done! Step One: Limit the time of access to dry food by giving free choice access to food, but only during certain time periods (leave food down for a few hours twice daily and remove the bowl after that, regardless of how much was eaten). Be careful to not let pets go more than a few meals without eating, but usually pets catch on very quickly to the adjustment. Step Two: Separate meals into bowls for each pet and measure how much they’re eating and only offer that amount (notice we’re not taking food away, just changing how we give it!). Step Three: Reduce the time the food is available from a few hours gradually to thirty minutes and finally down to five minutes, or however long you can monitor to ensure pets are eating their own food (and only their own food!). 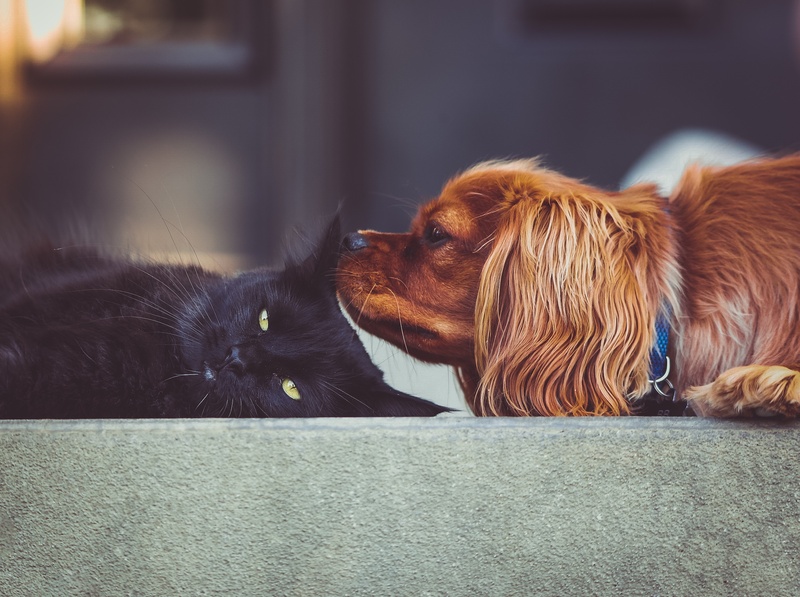 While many times pets can’t be fed the same food (for example, dog food doesn’t have all the necessary nutrients for cats; or a veterinary diet for one pet may not meet the nutritional needs of the others), in some cases, especially with healthy pets, there may be a solution that is appropriate for all dogs or all cats in the household. 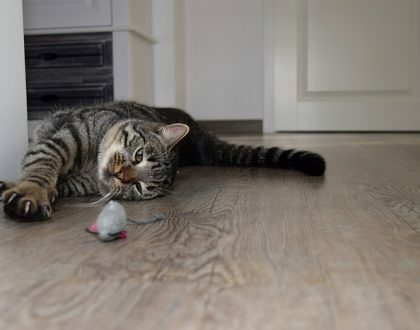 Heart disease in pets, for example, may require reducing sodium; a lower sodium diet is usually fine for all pets in the house to be fed even if they don’t have any heart problems. Ask your vet if this is an option. There are many options to help pets be fed separately that don’t require your supervision. A simple version is setting up automatic feeders in separate areas of the house that can be timed to go off simultaneously to encourage pets to go to their feeder at the same time (and not bug you!). More advanced techniques include feeders that only allow access to food after reading a chip on your pets’ collar, though this option may be a pricey one for some and usually only accept one collar (meaning you would need to buy one machine per pet). The simplest way to address feeding multiple pets is to physically separate all pets into different rooms during feeding times, or put up baby gates so dogs can see one another, but don’t take down the gate until everyone is finished eating. This may not be an option for all families or living situations, but getting creative can also be helpful. When there’s one ‘grazer’ pet and one ‘chow hound,’ we’ve had pet owners create barriers that one pet can access but the other can’t, such as up on table tops (for cats) or special dog or cat doors that will only open for specific pets to separate rooms with food. When one pet is overweight and another is trim, some pet owners even create a feeding set up where the larger pet cannot fit into a box with a small opening where the trim pet’s food is available.